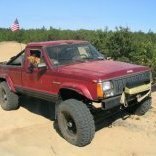 Swapping a 1978 Sunrader Shell onto a Comanche? Thoughts? I still have a great dislike for the Vee belt system. Especially when the alternator bracket doesn’t have the AC brace from above. So many of those broke over the years and I had at least one fall forward and eat the radiator with no warning.